When Dan Macdonald designed a new form of chess, he used whatever material was at hand. At the time, that happened to be a pizza box. “I said, ‘Well, I’m going to expand the board. I’m just gonna put an extra row on it. So I drew this thing out on a pizza box,” he says, recalling the first draft of Omega Chess. Since he dreamed up the game in 1992, it’s earned a devoted following, and Macdonald wants to take it further. But when he really thinks about it, he does have an idea. Part of that balance comes from the movements of the new chessmen, says Macdonald. The wizard, wearing a crescent-moon-shaped cap, jumps over other pieces like a knight but with further reach, though it can also move one square diagonally. The champion, decked out like a tiny plastic Roman warrior, leaps one square in any direction, or can slide one square forward, backward, or to either side. With its new possibilities, the game has captured the imaginations of others; the whim of a Toronto native has gone on to amass somewhat of a cult following globally, with references popping up on chess forums and Wikipedia. 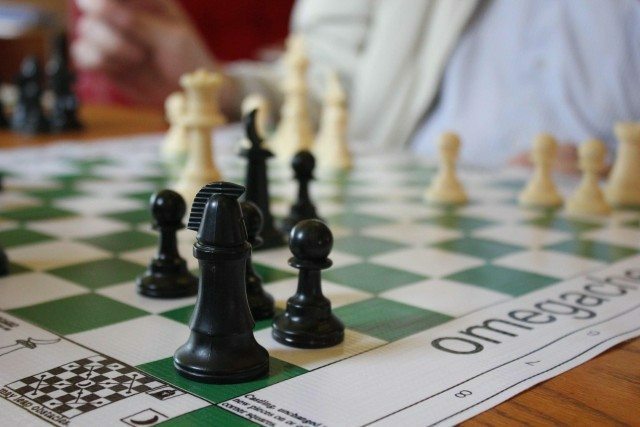 Over the 20-plus years following its invention, Omega Chess has received favourable reviews from professional players like grandmaster Michael Rohde and international master Brian Hartman, too. “Omega Chess could well prove to be the next evolution of chess,” writes the latter in a review on Macdonald’s official Omega Chess website. Perhaps one of Omega Chess’ biggest appeals is the fact that it makes book lines—opening-move sequences that have been memorized and perfected over years of top-level play and computer analysis—completely irrelevant, thus levelling the playing field. Conventional preparation is thrown out the window, and only raw talent and cold, hard calculation remains in its place. From the very first move, players wade into uncharted territory, but the ultimate objective is the same as in regular chess: checkmate, or threatening (checking) a king that has no way to escape. Although the game has never been mass-produced, in 1999 Macdonald and two investors put together around 1,000 Omega Chess sets. E-commerce then was hardly what it is today, but within months the boards had been sold to buyers all over the world, says Macdonald. He does so. In the early 2000s he pitched four major game producers, but according to Macdonald, a string of bad luck and “obscene things” kept the project shelved. For instance, the Omega Chess originator says he was in negotiations with Mattel, but then the division considering the game was bought out right in the middle of talks. Undeterred, Macdonald is now in the midst of making another push. This time around, he’s got a computer programmer working on a software version of Omega Chess. The idea is to get an online version set up where players can face off over the Internet. Once enough users register, Macdonald will be able to tangibly demonstrate interest in the game to a major company. “That’s the new strategy, and that could be a year or more away,” he explains. “As I like to say it’s 90 per cent chess, 10 per cent horror and delight,” he adds.